"Mountain Cloud Boys" redirects here. For the mission, see Mountain Cloud Boys (mission). The San Fierro Triads are large gangs originating from Hong Kong, who have since moved to San Fierro. 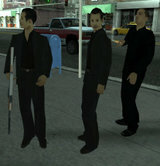 There are three Triad factions in San Fierro consisting of a set hierarchy with small sets answering to larger sets; the Blood Feather Triad, which would later be slaughtered by their rivals, the Da Nang Boys; the Red Gecko Tong, which is led by Ran Fa Li; and the Mountain Cloud Boys. The most prominent gang in the group, the Mountain Cloud Boys, is operated by the blind Wu Zi Mu and answers to the Red Gecko Tong. The sets of the SF Triads are heavily involved in joint operations and avoid violent conflict between the Triad factions, with the Mountain Cloud Boys establishing an alliance with the Red Gecko Tong. The SF Triads are also allied with high-ranking Grove Street Families member Carl Johnson and Varrios Los Aztecas leader Cesar Vialpando, and are rivals with the Mafia (Leone Family, Forelli Family, Sindacco Family), the Da Nang Boys, and the Loco Syndicate. Carl Johnson, having been exiled from Los Santos after the fall of the Grove Street Families, works for Wu Zi Mu's faction and helps them to destroy the Loco Syndicate and neutralize the Da Nang Boys (the Triads, on the other hand, seem to be on neutral relations with San Fierro's other gang, the San Fierro Rifa). In return the Triads aid Carl in Breaking the Bank at Caligula's robbing Caligula's Palace, give him a share in The Four Dragons Casino, and help him in seizing Madd Dogg's mansion back from a Los Santos Vagos drug dealer so the Grove Street Families could spearhead their return. The mansion serves as CJ's own base of operation in his return to Los Santos. San Fierro Triad members don all-black suits or all-gray suits. While the Triad gang members appear on the streets in Chinatown and Calton Heights in San Fierro. Strangely, they do not appear on Las Venturas streets, even areas surrounding the Four Dragons Casino, although they can be seen on several cutscenes and missions and can be made to appear on Las Venturas streets by means of editing the pedgrp.dat file. They usually wield AK-47s and pistols; however, in certain missions, they can be seen with different guns. Much like the Italian mafia is organized and uses ranks such as Don or Consigliere, the Triads use their own rank names and system. Shuk Foo (Lit. uncle); The Shuk Foo is the leader of a triad faction (a Tong) ; Ran Fa Li, for example, is the leader of the Red Gecko Tong. It can be compared to being the Don of a mafia family. Certain Tongs can also be led by Ah Kung (Lit. grandfather), which is a similar rank to Shuk Foo. Dai Dai Lo (Lit. big big brother); The Dai Dai Lo leads his own group of men (sometimes informally called a "crew") and answers directly to the Shuk Foo or Ah Kung. The Mountain Cloud Boys are led by a Dai Dai Lo, Wu Zi Mu. They can be compared to the italian mafia caporegimi. Dai Lo (Lit. big brother); These are the assistants of the Dai Dai Lo, who themselves are supported by men at street level. Those men organize themselves in small cliques or bands (much like how Carl Johnson can act as a clique leader by recruiting fellow Grove Street members) in order to carry out the Dai Lo's tasks; the clique leader is called a Yee Lo (lit. second brother), while the simple members are called Leng Jai (lit. little kid). It can be assumed that the Triads seen on the street are ranked as such. This page was last modified on 21 June 2015, at 07:30.